Did you know that around 70% of cigarette smokers say they want to quit? And yet, only 3-6% of smokers who try to quit without help are still off cigarettes one year later. * Because cigarette smoking is the leading preventable cause of mortality, kicking the habit for good is truly a life and death decision. No matter your age or how long you’ve been smoking, there are still health benefits to be received by quitting. The good news is that you can increase the likelihood of quitting by up to 10 times if you talk with your healthcare provider and obtain the right treatment. Once you have decided to quit, a thorough discussion should be held with your doctor and a personalized plan can be assembled based on your smoking history and the methods you may have used in previous attempts to quit. Here are five tips to remember when creating your plan. Set a Quit Date – This is normally scheduled 2-4 weeks in the future. This will give you time to assemble the resources needed to deal with nicotine withdrawal and other barriers to quitting. This will also give you time to tell family, friends, and coworkers, and to request their support in your decision. Expect to Have Nicotine Withdrawal – Once you quit, your mind and body will develop cravings for cigarettes that tend to be strongest in the first three days of smoking cessation. You may also experience increased appetite, weight gain, mood changes, difficulty sleeping, anxiety, and restlessness. Symptoms should gradually decrease over 3-4 weeks. It is important to not be surprised, but expect that these symptoms will occur. Your doctor can prescribe a smoking cessation medication that will help alleviate these symptoms. Don’t Expect to Quit Alone – You are more likely to quit smoking when you have a support system. 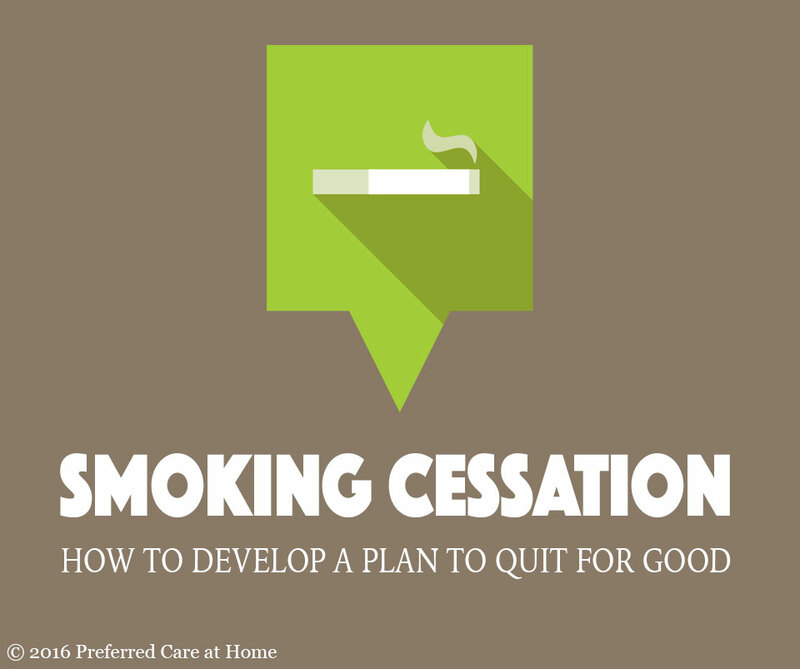 For some individuals, specialty clinics or a formal smoking cessation program may be helpful. Even if you can’t participate in a formal program, there is a free telephone quitline (1-800-QUIT-NOW) that can provide free counseling and encouragement. Don’t Be a Stranger – Your doctor may want to schedule regular follow ups to check in with you. It is important to keep these appointments and discuss any difficulties you may have or temptations to begin smoking again. Relapse Is Not a Failure – If you happen to relapse, know that you are not alone. While some are able to quit on their first attempt, most smokers require multiple attempts before quitting for good. A relapse does not mean that all hope is lost for quitting. It may just mean talking to your doctor to tweak part of your plan or try a different method. We at Preferred Care at Home are dedicated to improving the quality of life for seniors and their loved ones. If you or your senior loved one want to quit smoking but need additional support, we are here to help. Our services include transportation to doctor’s appointments and support groups that can help you meet your goals. With the right plan and support, you can quit smoking.